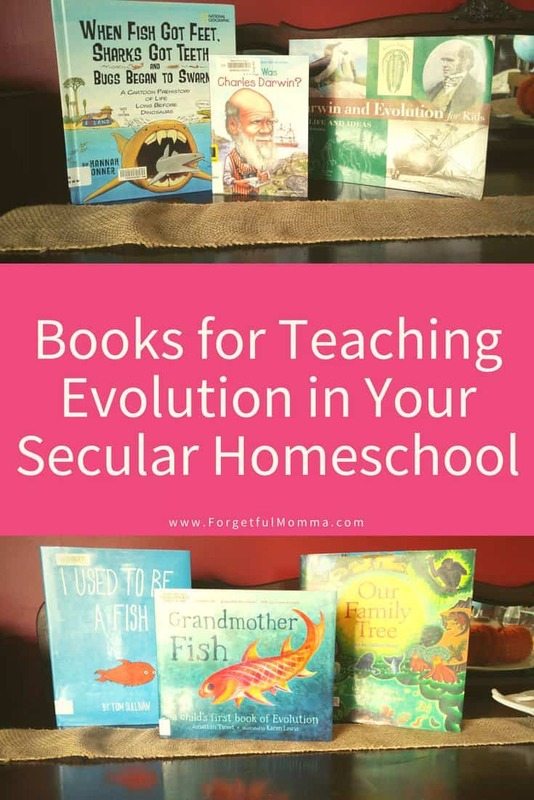 We are heading into our fourth year of homeschooling, our second year using an all-in-one curriculum, and our first year with all three kids officially in school. It’s also our first year starting school in August instead of sticking with the public school year here in Saskatchewan. But starting early we are, we’re starting lite this summer, working our way slowly into our routine. I’m planning on starting with teaching evolution. Our science curriculum does not cover it, so this is the perfect time for us to read some great books. Books for young elementary aged children. I got a few books from the library that I just loved. Three of them, that explained evolution to children in a way that they can easily understand. I Used to Be A Fish – a boy is inspired by a pet fish and fueled by imagination to tell a whimsical version of his own life story, which mirrors the process of human evolution. Children—and adults—will love the absurdity of this tale. Grandmother Fish – Told in an engaging call and response text where a child can wiggle like a fish or hoot like an ape and brought to life by vibrant artwork, Grandmother Fish takes children and adults through the history of life on our planet and explains how we are all connected. Our Family Tree – Open this family album and embark on an amazing journey. You’ll meet some of our oldest relatives–from both the land and the sea–and discover what we inherited from each of them along the many steps of our wondrous past. Here are some other good books. More for the 10+ years of age group than young kids. But still good books. When Fish Got Feet, Sharks Got Teeth, and Bugs Began to Swarm – Take a fun, fact-filled trip back to Earth as it was 430 million years ago. Then, watch as continents drift and oceans take shape. Who was Charles Darwin? – About 100 illustrations and a clear, exciting text will make Darwin and his theory of evolution an exciting discovery for every young reader. Darwin and Evolution for Kids – By encouraging children, parents, and teachers to define the differences between theories and beliefs, facts and opinions, Darwin and Evolution for Kids does not shy away from a theory that continues to spark heated public debate more than a century after it was first proposed.